Today’s players are not good at one thing. They are good at a lot of things. With that in mind we set out to design something that would deliver the needs of all players into one boot. 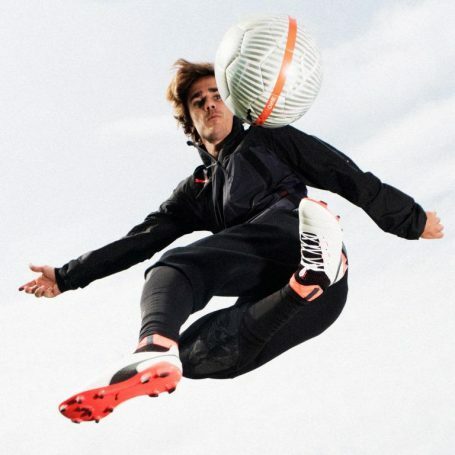 To begin with we consulted Antoine Griezmann, youth academy players and football obsessed teens. What was abundantly clear was that they wanted a boot that had a great FIT, that helped them to move FAST and gave them more FEEL on the ball. To complete the process Thierry Henry was brought on board and played a major role in ensuring we catered to every type of player. Thanks to these insights we can deliver a football boot that excels in FIT, FAST and FEEL. FIT comes from the engineered evoKNIT sock, FAST is provided by our ultra lightweight Pebax outsole, whilst FEEL is enhanced by the super soft leather that adorns the upper. From the tough tackling defender to the swift footed striker we can now offer a boot that reflects the perfectionist in all of us. … because you’ll be able to tell your girl you share something with Antoine Griezmann. … because it’s gonna be the first time the first ONE is actually good. … because for the first time in your life, thanks to the flashy sole-plate, the opponent you’ve just skinned will be able to follow you. Or at least try. … because this is your first real leather boot. And you thought you’d needed to be 40 and being a bank manager to get some. … because being classic doesn’t mean being « old fashionned ». It means quality leather which is gonna allow you to drop some classics on the pitch. …because when you go for a burger you want the meat, the cheese and the bun. So you naturally want a boot with Fit, Fast and Feel. One without the other two just doesn’t feel right.